You will be excited to wear this fashion jewelry line from New York, LŪVENTE. LŪVENTE is a premium brand designed for the most sophisticated buyer with an appreciation for the finer things in life. A brand that promises to capture your imagination, and adorn you in luxury. It is jewelry to commemorate all of life’s cherished moments, a Birthday, Anniversary, Valentine’s Day, Mother’s Day, Graduation, or Christmas/Holiday Season. Seize the moment with LŪVENTE. LŪVENTE jewelry encapsulates the perfect balance of art and wearability that is certain to capture your style and individuality. A jewelry collection characterized by unique diamond and gemstone jewelry that will not stand to be locked away from the world in your jewelry box. LŪVENTE specializes in transforming classic designs into unique jewelry that showcases true modern art; worn close to your face, and your heart. 14K ROSE GOLD DIAMOND HINGED BRACELET WITH 84 SINGLE CUT DIAMOND TOTALING 0.53 CARATS, G-H INC OLOR, SI IN CLIARTY. 8.02 GRAMS. This LŪVENTE Diamond Bracelet is crafted in 14K Rose Gold and features a total of (84) Single Cut Diamonds totaling 0.53 carats that are SI in Clarity, G-H in Color. The hinged bracelet has a Total Weight of 8.02 grams. LŪVENTE’s premier jewelry line also boasts a line of fine jewelry mounted with your favorite gemstones that embody the beauty of nature. Finally, a custom jewelry collection that synthesizes the most intricate details and a full spectrum of colored gemstones to accentuate the beauty of your birthstone jewelry. No piece of LŪVENTE jewelry is fit for pandora’s box! LŪVENTE cares just as much about quality as they do about their flawless designs. LŪVENTE Jewelry comes with a Lifetime Warranty that guarantees quality, workmanship, and authenticity for the life of the piece. Celebrate the unique moments that define a lifetime with handcrafted jewelry by LŪVENTE. Buying a diamond for the first time can be an inundating task. Here is a quick diamond education to catch you up to speed before you decide on the perfect diamond for your lover. Cut is the factor that fuels a diamond’s fire, sparkle and brilliance. The traditional 58 facets in a round brilliant diamond, each precisely cut and defined, are as small as two millimeters in diameter. But without this precision, a You may already know that diamonds form deep within the earth, under extreme heat and pressure, and due to this process often show unique birthmarks, either internally (inclusions) or externally (blemishes). A diamond's clarity refers to the absence of these inclusions and blemishes. Diamonds without these birthmarks are rare, and rarity affects a diamond’s value. Using the GIA Diamond Clarity Scale, diamonds are assigned a clarity grade that ranges from Flawless (FL) to Included (I3) where the diamonds have obvious inclusions to the naked eye. Every diamond is unique! None is absolutely perfect under 10X magnification, though some come close. These almost perfect diamonds are known as Flawless diamonds, both internally and externally. Flawless diamonds are exceptionally rare and valuable. Cut is the factor that fuels a diamond’s fire, sparkle and brilliance. The traditional 58 facets in a round brilliant diamond, each precisely cut and defined, are as small as two millimeters in diameter. But without this precision, a diamond wouldn’t be nearly as beautiful. The allure of a particular diamond depends more on cut than anything else. As a value factor, though, cut refers to a diamond’s Proportions, Symmetry and Polish. For example, look at a side view of the standard round brilliant in the diagram below. The major components, from top to bottom, are the Crown, Girdle and Pavilion. A round brilliant cut diamond has 57 or 58 facets, the 58th being a tiny flat facet at the bottom of the pavilion that’s known as the Culet. The large, flat facet on the top is the Table. 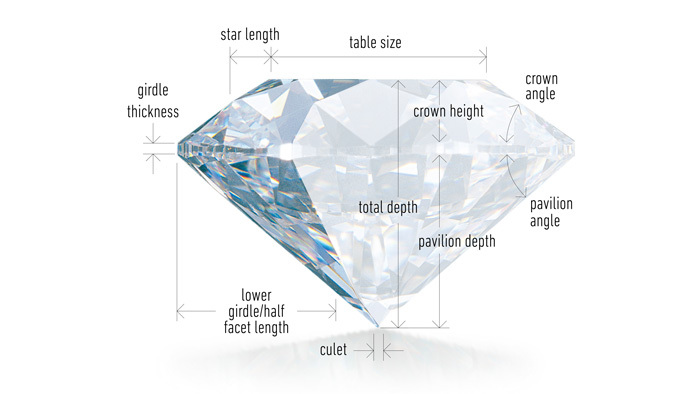 The proportions of a diamond refer to the relationships between the Table size, Crown Angle and Pavilion Depth. A wide range of combinations in a diamonds proportions are possible, and these ultimately affect the stone’s interaction with light. In early 2005, GIA unveiled a diamond cut grading system for standard round brilliants in the D-to-Z color range. This system was the product of more than 15 years of intensive research and testing, and assigns an overall diamond cut grade ranging from Excellent to Poor.